Not only is this a good year for the dogwoods, but the pink lady's slippers are really blooming. I found some hiding out under the bracken ferns. The lady's slipper is an orchid that loves the patchy sun in a woods near me. I love the orchids because of their beauty, and among other things, their bizarre pollination systems. 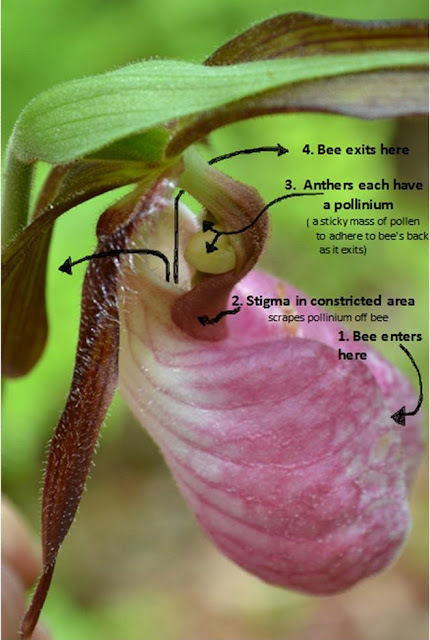 In this post I would like to examine the pollination system of the pink lady's slipper. The lady's slipper attracts the bees and tricks them into entering a one-way trap door into its pouch (the pouches lips part inward). Once inside, and with no nectar reward, the bee must escape up through a tunnel at the upper end of the flower rather then exiting the way it came. As the bee passes through this constricted area, the stigma is positioned to scrape off any pollinia if the bee had previously visited another lady's slipper. At the upper end of the tunnel there is an exit on either side where the anthers are positioned to give the bee a parting gift of a pollinium (a sticky mass of pollen). The plan is that the deceived bee will try again on another lady's slipper, and with a pollinium adhered to its back, enter the trap and pass the stigma where the pollinium is removed, thus ensuring cross-pollination of the lady's slipper. into performing a free cross-pollination service for the lady's slipper. In other words, "the bees have been set up"
The pink lady's slipper has an elaborate pollination device, but that's not all of the amazing things this plant is designed to do. I'll post about those later. I couldn't resist a "parting shot". I just found a couple of pink lady slippers in a local park near me and was googling to figure out pollination and life cycle of these orchids and found your blog. Best description and diagram I've read yet. Nice pictures to boot. I'm definitely going to link this post on my blog when I do the lady slipper post. Now all I have to do is find more of our native orchids! I'm glad to hear this post's information was useful to you. Good luck finding more native orchids. They seem to be picky as far as habitats where they live. Yesterday I walked all around a bog, through the ecotone, and through the bog... I didn't see a bloomin' orchid. Maybe I'll look again at the same bog in a couple of weeks. or click on the label "orchid" that is on the left in the navigation column. Definitely useful. I did check out your other orchid posts very cool!